The Switchback Brewing Company was founded in 2002 by Bill Cherry and his longtime friend, Jeff Neiblum, with one goal in mind – to brew unexpected, relatable, great tasting beer. The two combined Bill’s expertise in brewing and science with Jeff’s experience as a business entrepreneur. They began testing equipment in August and brewed the first salable batch of Switchback Ale in September. The very first pint of Switchback ever served was at Ake’s Place in Burlington, VT on October 22, 2002. The idea that became Switchback Ale was developed in Bill’s imagination, with no test brewing. He envisioned maximizing complexity, flavor, and delivering beer the way a brewmaster experiences it. To do this, the beer is left unfiltered and is carbonated 100% naturally in a special process using the yeast. The result is a beer that defies easy description, because it is brewed to a flavor idea and not based on any existing style guidelines. All Switchback beers are brewed this way. The marketing plan had always been to introduce draught beer first in Vermont only, which allowed Bill to do all of the brewing, packaging, cleaning, and selling by himself until sales justified hiring some help. 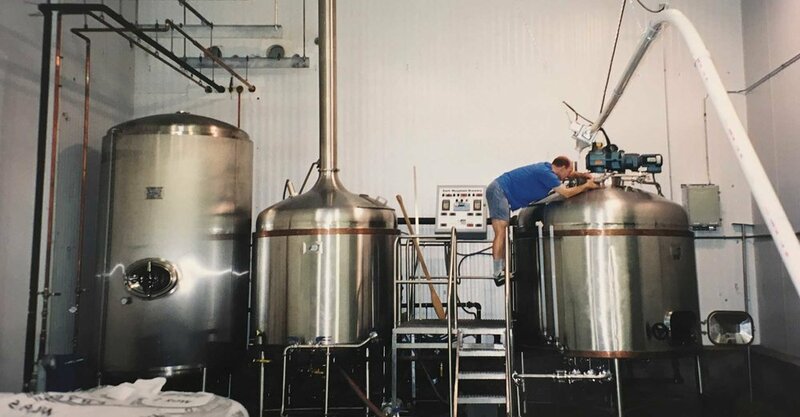 The brewery hired its first employee, Chris Dooley, in 2003 and eventually ran 24-hours a day to keep up with demand. As demand continued to grow, the brewery added state-of-the art German equipment including a 1964 built copper brewhouse from the Brauerei Schmucker in Beerfelden, Germany, a bottling line and a canning line to ensure the high quality and flavor standards Switchback fans had grown to love. We added the Tap Room at Switchback in 2014 as an outlet to showcase experimental brews and limited release batches you usually can’t find anywhere else. We also host beer-themed events including Stretch & Sip Yoga, Cheese and Beer Pairings and various educational classes. Today, the Switchback lineup has grown to include over 20 beers as year-round offerings, rotating specials and limited releases and we haven’t stopped reimagining flavor. Our flagship, Switchback Ale, is available on draught and in 22oz bottles, 12oz stubby bottles, and 16oz cans. Our combo pack gives fans a chance to enjoy an assortment of Switchback beers. Now available throughout New England and in New York, beer fans can enjoy Switchback's consistent quality and flavor on tap, in bottles and in cans wherever their adventures take them. Founder, brewmaster and president Bill Cherry took another bold step in 2017 when he turned ownership of the brewery over to the employees. Switchback is now 100% employee owned via an Employee Stock Ownership Plan (ESOP) and will remain locally-owned and -operated forever. Switchback is the first Vermont brewery to operate under this structure. In addition to Cherry, the brewery is operated by a management team with an off-site board of directors providing occasional support. It's a collaborative management style and environment of ingenuity that assures Switchback will always be made locally by real brewers and not high-production operations. The best news? Beer fans can count on the brewery to provide a great beer experience every time they choose Switchback beer.